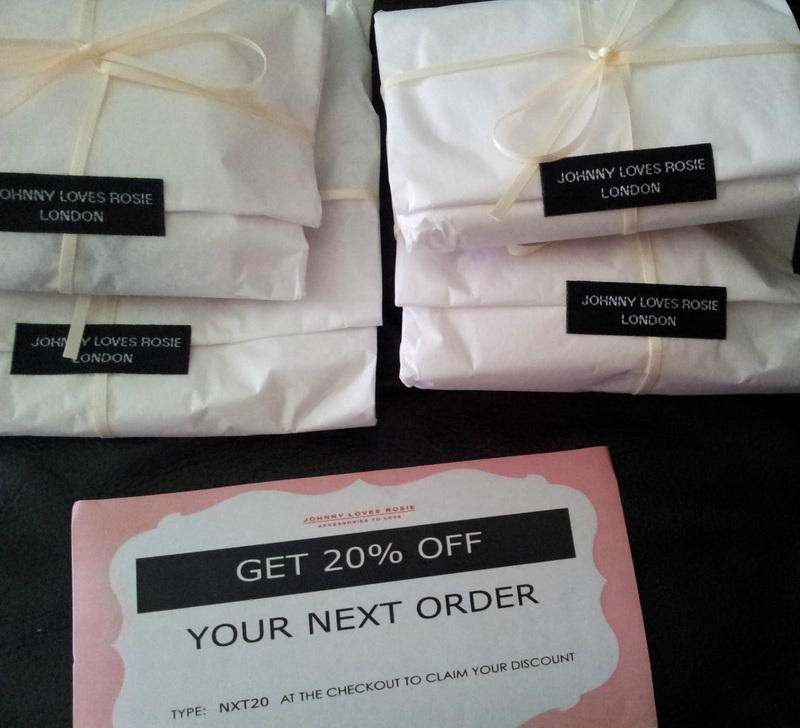 I recently won a competition over on Johnny Loves Rosie's Twitter page *yay* My prize was £50 to spend over on their website. I've loved the company since I was a teen and with the rise of stores like Primark I will admit, I have by-passed the company when shopping for accessories in the past. After browsing all day, literally I spend all day on and off trying to decide what to buy eventually deciding on four products. They arrived a few days later and it was once they arrived I realised how much the company cares about their brand image and their customers over all. Firstly they all arrived individually wrapped in tissue paper, tied with a silky cream ribbon and sealed with a branded fabric sticker. Once I had unwrapped the products I found they where each sealed in their own little branded pouches. Fancy huh! The items I choose were the black flower barrette - I figured this would last a bit longer than the floral crown trend. I also chose a bow barrette but it was out of stock so they sent me this one - This one is damaged but I 'think' I've fixed it. The strand you see poking out of the top has come off and the beads are all falling off. 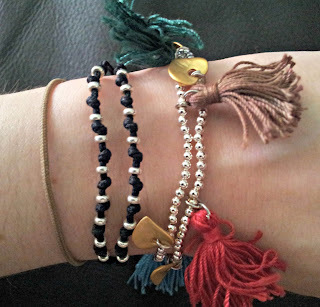 I then chose the tassel bracelet because look how bloomin cute that is, I adore tassells and this was calling my name. 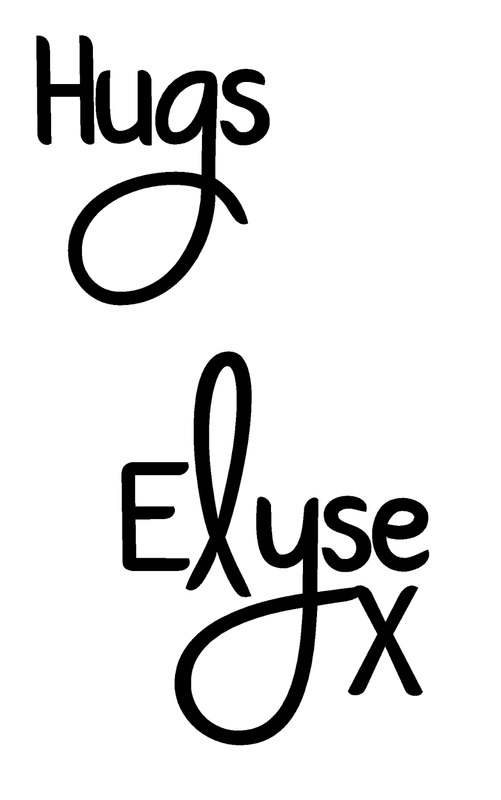 I'm sure tassells are going to be MEGA for A/W 13. 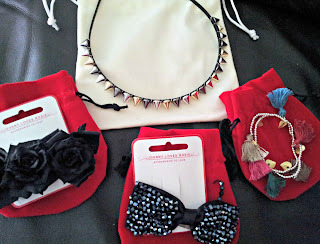 Finally my spike headband - I adore this, I really do. I can't wear the material headbands because my heads flat at the back so when I come across a good half head headband I get all over it. Here's a closer pic of my tassel bracelet joining my Gina Stewart Cox arm party. I'm slightly gutted however because my headband was £16, If I had only waited a few days I would have gotten it in the sale for £8 - Gah don't you hate when that happens. You can get 20% off when you enter NXT20 at checkout. They also have a fab sale on over on their website HERE.